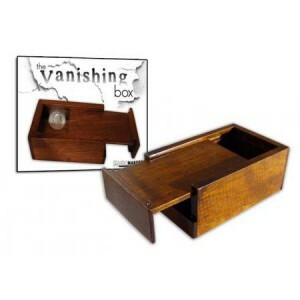 The Vanishing Box, known as the Professional Rattle Box to working magicians, instantly vanishes coins, rings, and other small objects! A coin is marked by a spectator and dropped into a small hardwood box and the lid is closed. The magician shakes the box, rattling the coin inside, and gives it to a spectator to hold. When the box is opened, the coin has vanished! High quality function and feel. Easy to do! Measures 3.5 x 2.25 x 1.5 inches.